You don’t have to be a fan of the greatest series of all time, Game of Thrones, to know what it is about and how good it is. 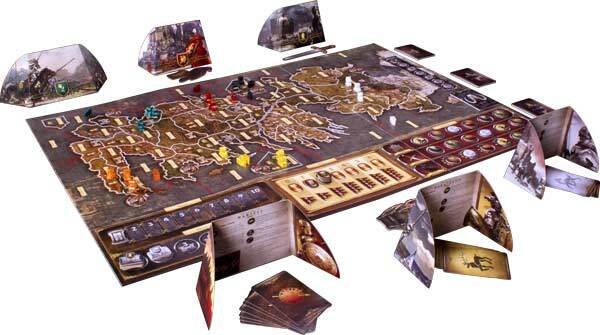 After it began and became a phenominal hit, the board game edition finally came out – now fans could take a role and play as the major houses from the series. Before we delve into the world of Westeros, I would like to give you some background. I started playing the second edition before I even become a fan of the series. I might even say it worked the other way around for me: I got hooked on the game, which led me to Game of Thrones world of fantasy. 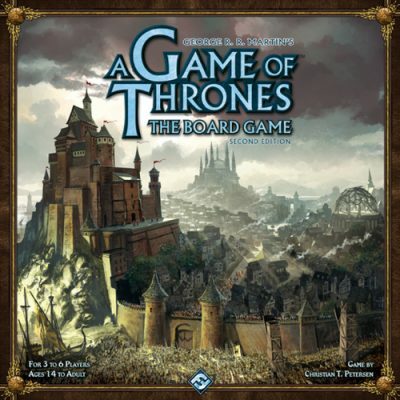 I have played A Game of Thrones board game with two different groups of people: my gaming gang – who always sits down together at some board game café to find some new and interesting games – and with my beloved cousins. I always play with 5-6 people – never less than that – based onadvice from a board game master at my favorite board game café. He said that it is best played with 6 people around the table. This game completely works in its theme. You are one of the houses. You are fighting against other houses to conquer Westeros, and earn the right to sit on the famous Iron Throne. Character abilities and the game mechanics work so well that it gives you the sense of being in Westeros. Let’s get one thing straight: I love a game with sturdy components. A Game of Thrones board game has done a pretty good job with this stuff. Good quality marble-patterned armies, fat cardboard tokens, and thick playing cards. However, what is really impressive to me is the artwork of the components, which strengthens the feeling of the game and enhances the fantasy world. This is the selling point of this game. There are many mechanics that work really well: siege engines, Wildling attacks, support barrels, and others. For me, the two key mechanics have to do with combat and bidding for areas of influence. Combat works with order tokens on each of your armies and navies. These allow them to raid, support or move/attack. Each allows you to maneuver your forces, but as they are all hidden the exact combination can be a surprise. On top of that, you have character cards that change the nature of the combat. And, I think most importantly, Tides of battle, which add a small random element to the attack. The other key mechanic is bidding. Bidding allows you to use the power you gain throughout the game by changing the dynamics of turn order, winning combat ties and the use of special orders. This can shift the game significantly, and allow you to influence events your way, which is always nice in a mechanic. When I play this ‘High Strategy’ kind of game, there is not a second that I stop thinking about my next move. The simultaneous play means that the downtime is cut down to the bone. All the mechanics make the game run reasonably smoothly – but it is not easy. This is a long game, which takes 3 hours to play on average. It doesn’t feel that long, though. You keep your eyes on the prize and mind on how you can overcome all the opposition to win the Iron Throne. With unique starting positions, house cards etc. ; the game goes very differently every time, depending on the distribution of the “event cards”. Furthermore, as there is a high level of interaction, the choices of your opponents have a butterfly effect –small differences on their behalf can mean a whole new world of problems for you. I mean, what more do you want? As there is almost no way you can develop a set of optimal movements for each house you play. This is an outstanding game you don’t want to miss. It delivers all the strategy you could want from a war game, and all the diplomacy and backstabbing you could want from any game. It has a nice mixture of mathematical/tactical decisions, human interaction through negotiation, turnabouts, reversals of fortune, and high drama.